Before Saturday, Czech Republic's Ester Ledecka's best result in super-G was 19th -- then she won gold in the Olympics. 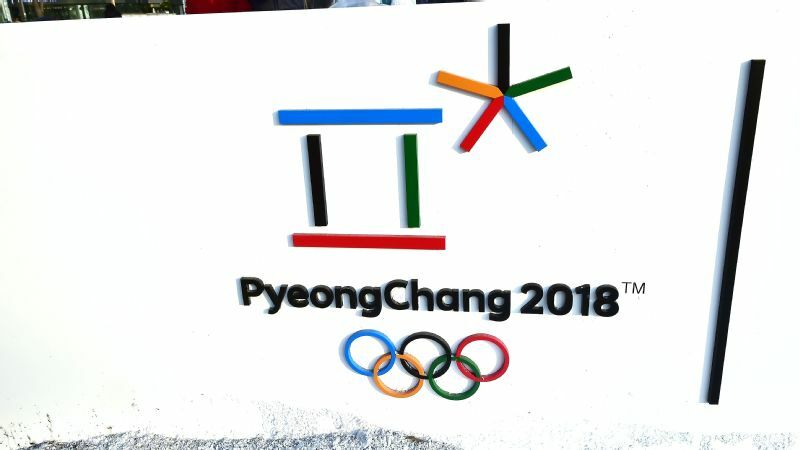 JEONGSEON, South Korea -- As she crossed the finish line for the Olympic super-G Saturday afternoon, Ester Ledecka from the Czech Republic looked to the scoreboard, saw a massive green No. 1 next to her name and didn't believe it. Like really didn't believe it. "I thought this was a mistake," she said. "I was looking at the board, thinking they are going to put up there a couple more seconds. I was waiting and watching until they would change the time. And then nothing happened. Everyone was screaming and I thought to myself, 'OK, now this is weird.' "
Weird because the 22-year-old had never made the podium in 23 World Cup alpine races. Weird because her best result ever in super-G was 19th. And weird because she was actually a snowboarder, the first winter sports athlete to compete in the Olympics in both skiing and snowboard racing. But there was no mistake. 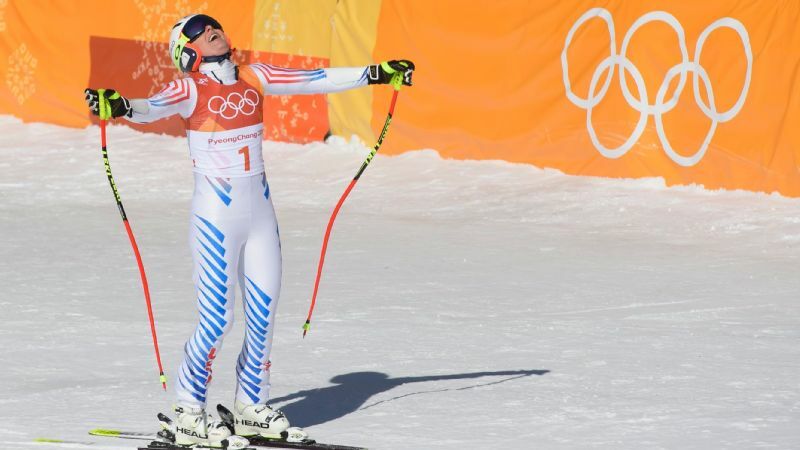 Ledecka's time of 1:21.11 was one-hundredth of a second faster than Austria's Anna Veith, giving her super-G gold in one of the most stunning upsets of these Olympic Games. So perhaps then, it made sense why Ledecka refused to remove her goggles at the post-race news conference. "I was not prepared that I would be at this ceremony," she explained. "And I don't have on any makeup." Lindsey Vonn was the first skier to go, and by the time she reached the bottom she knew she had made a costly mistake near the end of the course. American Lindsey Vonn, the favorite entering the race, finished tied for sixth. Vonn drew the first starting position and was about to post a strong run when she lost control three gates from the finish and nearly crashed. The miscue slowed Vonn by .38 seconds in the final interval, the exact margin by which Ledecka beat her. "I knew exactly what I needed to do," she said. "I just made a mistake. Everything lined up except for one turn. But that's ski racing. 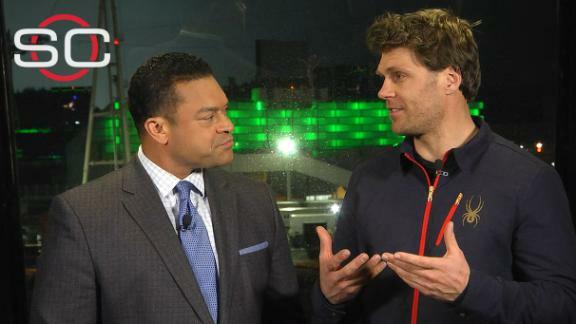 That's why it's so difficult to win at the Olympics because anything can happen." On Saturday morning, that anything was Ledecka. Before her race, her snowboard coach, retired U.S. parallel slalom racer Justin Reiter, joked to Ledecka that she needed to win Saturday so she could take all the pressure off on Feb. 24, where she's the favorite in the parallel slalom. A few hours later, Reiter watched in amazement as Ledecka stood in the finish area paralyzed by the result. "That's pure Ester," he said. "She will focus entirely on the task without giving through to the result, the gold medal. Her focus today was a good run. She wanted to come down here and be the first person ever to ski and snowboard race." Now she has the chance to be the first to not only race in ski and snowboard, but win. 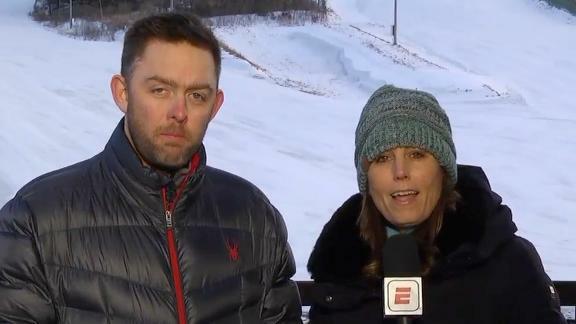 In fact, if she were to win gold in the parallel giant slalom she'd be the first woman to win gold in two different disciplines in the same Winter Olympics. Norway's Johan Grottumsbraten (1928) and Thorleif Haug (1924) doubled up in cross country and Nordic combined. "I wish I had as much athleticism as she does to win in two sports in the same Olympics," said Vonn, who will next race in Wednesday's downhill. "I'm only good at one sport. The fact that she's able to beat all of us and be a snowboarder is pretty darn impressive." Added fellow American Laurenne Ross, who finished 15th Saturday, "That's something that's so special and magical about the Olympics. Sometimes you get unexpected results and it's so exciting for those people who can pop in there. I'm so psyched for Ester." Since she was 4 years old, Ledecka said she decided she would compete in snowboarding GS and skiing. It can be a grind, as she bounces back and forth between the skiing and snowboarding World Cups. But Reiter said he has never seen an athlete so focused and driven to achieve success. And this year, he added, she has learned how to better manage her energy. Ledecka had won training runs with the best alpine racers in the world but had yet to put it together in a race. That finally happened Saturday on the biggest stage in the world. "The way she learns is unlike anyone," Reiter said. "You guys are finally paying attention to that. All it took was an Olympic gold medal." The juggling act is likely to get more challenging. The first sacrifice came Saturday, when she found herself at the post-race news conference instead of training for her snowboard race, as had been previously scheduled. "I don't want to be rude. You're all great," she said to a packed room of reporters. "But I really didn't expect I would be sitting here. I should already have like three runs on the snowboard." When asked what similarities there were between skiing and snowboarding, she again was quick to go for a laugh. "It's down a hill, both of them," she said. "So yeah ... that's the base of it I think." Now comes her next challenge -- dealing with the blindingly bright spotlight she never thought possible. On Saturday, she skied down the Jeongseon course in relative obscurity. There was no pressure. In next Saturday's snowboard race she'll be the favorite. No longer a nameless face in the crowd. As for about after that? Maybe she wants to windsurf in Tokyo in 2020? "Yeah, for sure," she said Saturday. "Why not?"